Spring means planting season. But what if you have an apartment or small lot? A container garden might be the right answer for you! 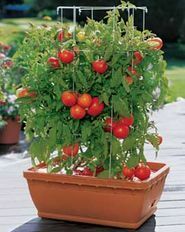 This class will give you all the basics in creating a vegetable garden in a container on your porch or patio. Have fresh vegetables for cooking and snacking any time you’d like! Kimberley M. Knox is a certified arborist and a Master Gardener. She is also the coordinator for the Port Towns Community Health Partnership. FREE container garden giveaway! To support the Edmonston Green Team’s edible gardens initiative, we will be giving away free container gardens to Edmonston residents. If you are a resident of Edmonston, Maryland and would like to bring home a pre-planted container garden, please bring proof of residency to this class. Kim will be giving out container gardens while supplies last.